Basements are tricky. These large spaces beg for a new use, but they often become dumping grounds for all of life's extras. If selling your house in this market isn't an option but you want extra living space, you might find yourself pacing back and forth in the basement wondering if you can convert it to the room of your dreams. As the photos below show, it's possible — and the options are endless. When you think of finished basements, you probably think of a room that isn't finished to the standards of the rooms upstairs. This doesn't need to be the case. 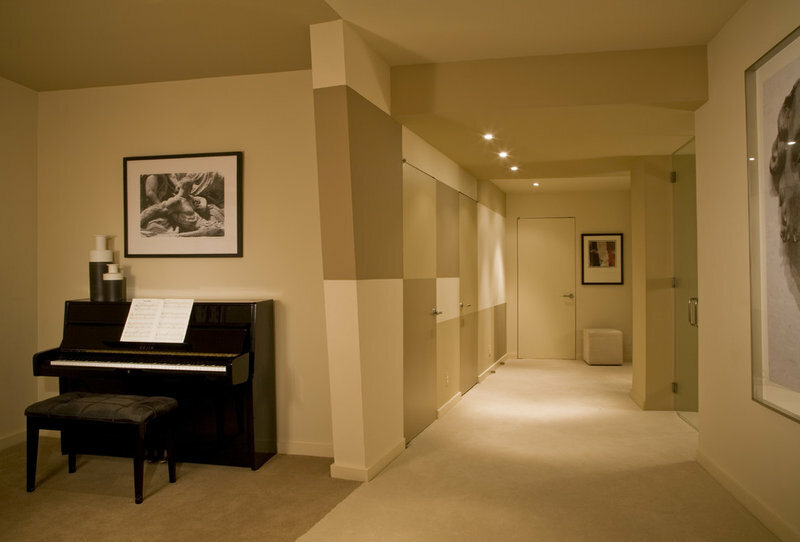 But the challenge of creating an inviting and beautiful space is greater in the basement, where the systems and infrastructure of your house need to be concealed tastefully. 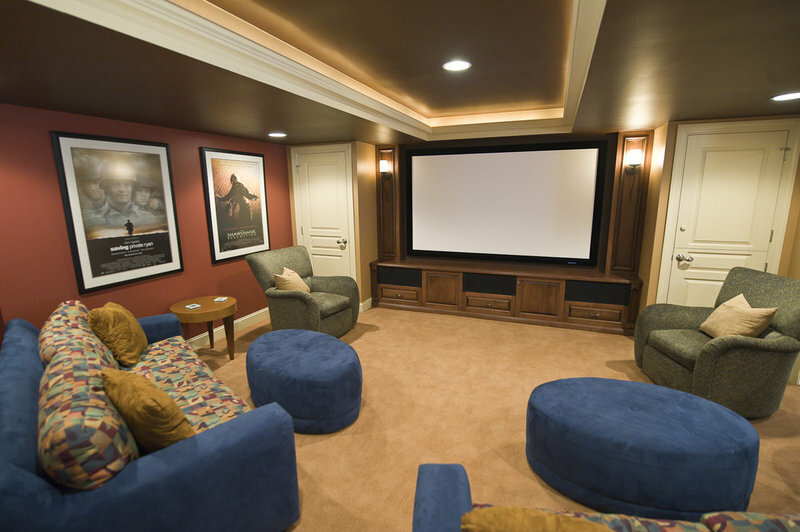 A finished basement definitely adds value to your home, but be sure to check with your insurance agent. Some finished basements may not be insured — and don't expect a bedroom there to count in the total of bedrooms when you sell the house. Plumbing. If you want to add a bathroom in the basement, find your soil stack and see whether the main drain for the house goes underground or runs aboveground. If it runs underground, as long as you put the new bathroom near it, plumbingshouldn't be much more difficult than upstairs. Natural light. 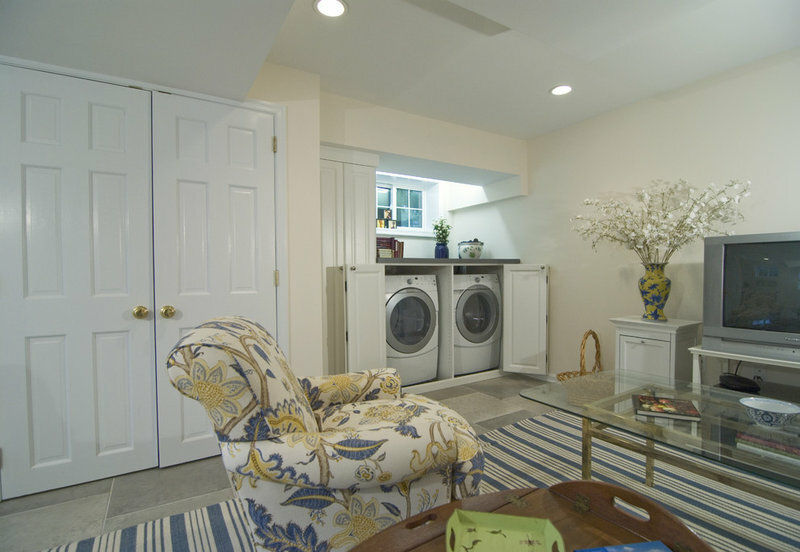 Natural light is often in short supply in a basement. In this picture, the kitchen was placed by the lone window to maximize sunlight in the prep area. Also, many building codes require a second way to exit the basement if the space is going to be finished. Get more light and satisfy code requirements by installing an egress window and window well. An egress window is big enough for a person to exit through it, and the well allows more light into your basement. To avoid water problems, have a drain installed at the bottom of the well. The ceiling. You would never know this room is in a basement. There are always pipes, ducts and wires to conceal. This usually means dropping the ceiling height in certain areas. Try to consolidate the obstructions to one area and then create a space with a lower ceiling. Continue the dropped ceiling to the walls for a natural transition. Boxing in pipes and ducts with soffits and chases tells people that there's something hidden. Of course, the other thing that makes this basement look like it belongs upstairs is the use of drywall. You'll need to place access panels where shutoffs, junction boxes or meters are. Make sure to install the drywall ½ inch off the ground and use moisture-resistant drywall. All basements flood eventually, and this will help. Fiberglass-faced drywall is even better than paper-faced drywall, because it's the paper that harbors mold. Be prepared to pay extra for finishing the fiberglass drywall, because the whole face should be skim coated with joint compound. 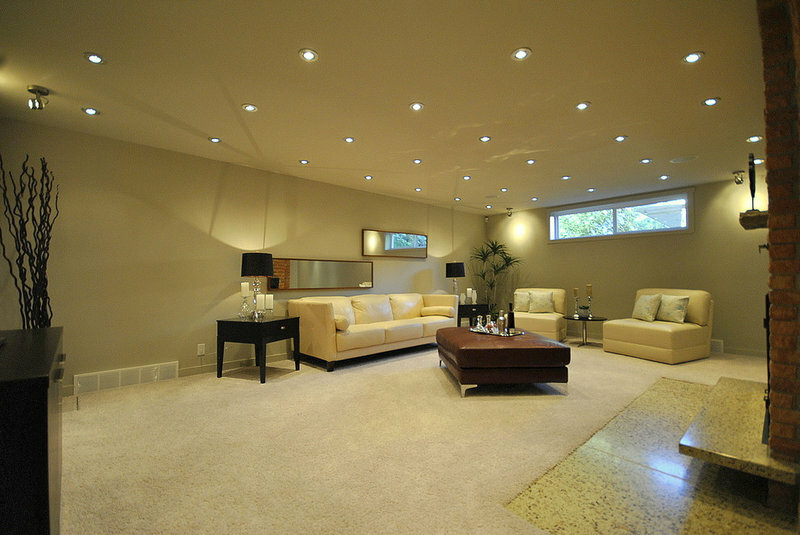 Finished basements traditionally had ceiling tiles in a grid rather than a drywall ceiling. Most people don't like this look, so we're seeing more and more drywall ceilings. 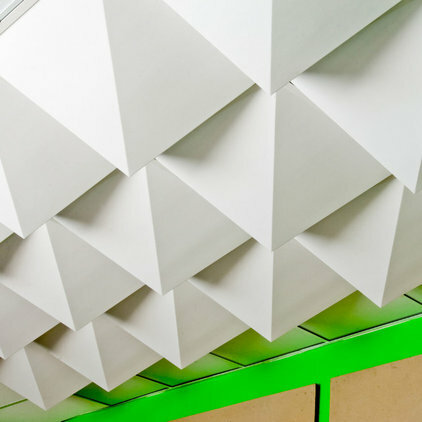 If you want easy access to the space above the basement ceiling but want a more interesting look, consider sculptural ceiling tiles from Mio. Because a basement is below the bathrooms, kitchen and other sources of water in the house, when a basement floods it often comes through the ceiling. If you have a drywall ceiling, you'll need to cut out a section and repair it. 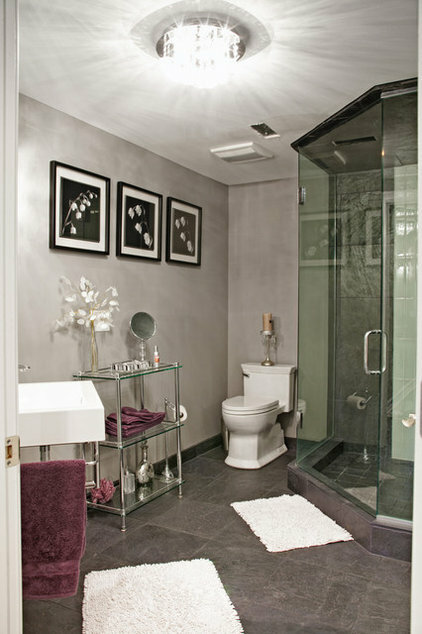 If you have ceiling tiles it may be as simple as replacing a tile or two. Height. 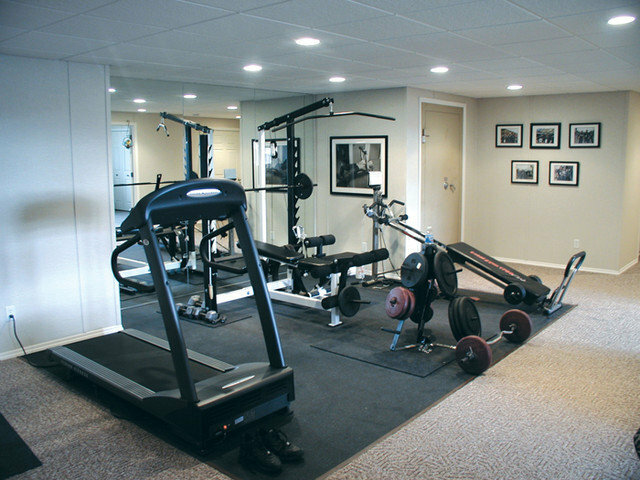 Think about how you plan to use your finished basement. If you want to exercise down there, you may need more headroom. Lift your arms overhead. I need an 8-foot ceiling to do that. Will you be standing on a treadmill? Add the height off the floor to your height. If you're actually going to run on the treadmill instead of posing for fake exerciseFacebook photos, you'll need even more room since you'll bounce up as you run. Often the height just isn't there. Recently, my company solved this problem two different ways for two different clients. In one house we cut out the floor joists in that area and hung them from structural headers. Then we added steel angles to support the floor. Ideally this area should be located under an area upstairs that doesn't get a lot of traffic, such as under a coffee table. In the other basement we couldn't locate the space out of the path of traffic, so it made more sense to go down. We dug a hole in the ground 12 inches down, poured a new slab at the lower level and poured little walls with a curb surround so the hole wouldn't fill with water if the basement got wet. Lowered into the hole, the treadmill is flush with the surrounding floor. Waterproofing. I know I keep coming back to flooding, but it will happen, so plan ahead. If you don't have a system in place to deal with the water, choose a flooring material that can handle getting wet, such as the tile shown in this basement. If you don't have a floor drain, get one installed. It's best to get a drain that ties into the storm drain directly or that drains into a pit with a sump pump in it. If you pay for these systems up front, you won't be paying to replace furniture, rugs and appliances later. Lighting. 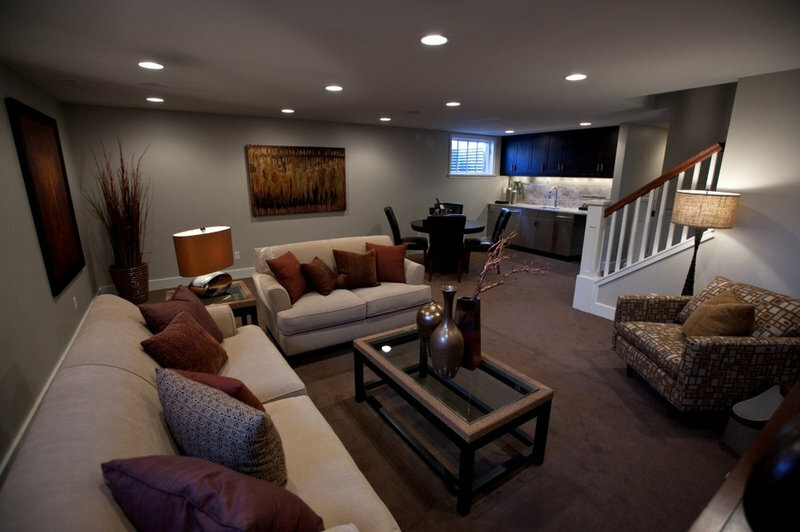 The most critical component to making a basement a place people want to hang out is good lighting. Here's another example of a well-planned ceiling layout. The tray ceiling in the middle is surrounded by lower areas that can conceal ductwork and piping. It also gave the builder a spot to install indirect lighting. Because the ceilings in a basement are usually lower than elsewhere in the house, light reflected up off the ceiling — like the ambient lighting in this tray ceiling or the sconces on the wall — is better than light directed down. If you plan to use recessed lighting in your low ceilings, think of the cone of light that spreads from a recessed light. The closer it is to the floor, the closer you'll need to space the lights to get good coverage. Good lighting design makes a big difference, so hire aprofessional lighting designer. 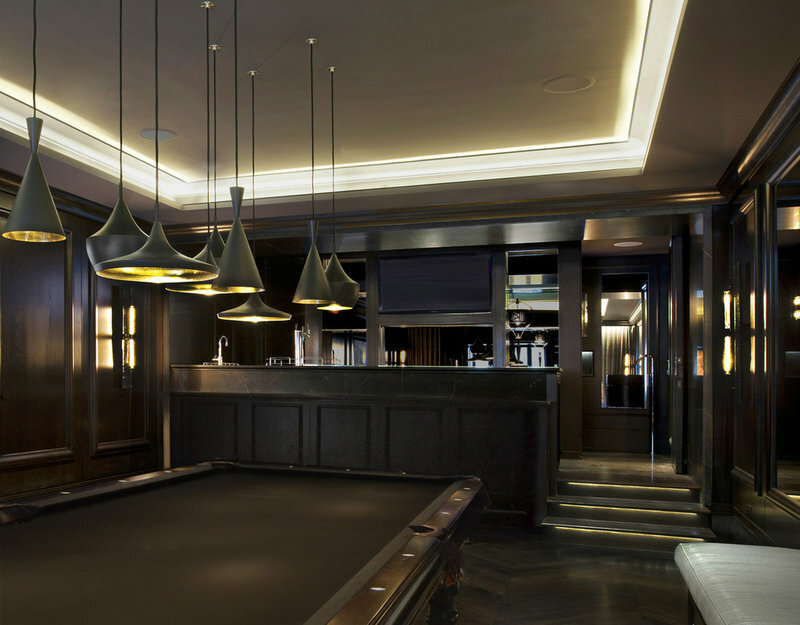 A variety of lighting types is important so the space can accommodate different uses and moods. There are many options now for energy-efficient lighting, so don't avoid LEDs and CFLs because you think they'll cast an unflattering light. Everything from cool to warm light is available in all types.